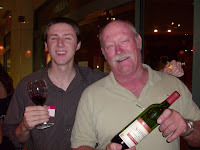 I was lucky enough to recently meet one of Napa Valley's legendary winemakers Nils Venge. Nils is the winemaker for Saddleback Cellars but has also made wine for or consulted for Groth, Del Dotto, Keenan, Plumpjack, Moss Creek, and Bacio Divino among others. He's a great guy with a humble personality and would treat you as if you were on his level. His Chardonnay was a beautiful example of the Classic Napa style and his Cab and Merlot were very good too. Cheers to Nils and thanks for the photo! Aww!! Lucky you! I wish I can have a talk with the owner too!